Health + Safety | Cultural Resource Analysts, Inc.
As a well-established industry leader among cultural resource management companies, CRA prides itself on being a safety-conscious company. We firmly believe that workplace safety and CRM studies go hand-in-hand and recognize that a safe working environment leads to higher quality work. Safety at CRA is accomplished by a proactive teamwork approach that begins with the selection of competent people and top-quality equipment in order to fulfill the needs of our clients in a safe and timely manner. Our full-time staff is especially invested in our safety program. As a result, safety plays an important role in our corporate culture. Safety requires a sustained conscious effort and is regarded as the responsibility of each and every one of our employees. For the last five years CRA has maintained an Experience Modification Rate (EMR) of less than 1. This EMR rating is a numeric representation of a company’s claims history and safety record as compared to others in the same industry. A rating of less than 1 means that CRA is a company rated safer than average for its industry. 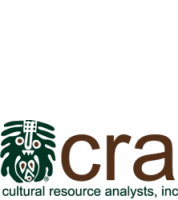 Given that cultural resource management can sometimes present hazardous conditions, CRA is very proud of its safer than average rating and its employees who routinely practice workplace safety. Ongoing safety training is a company-wide mandate at CRA. Each year, all of our employees participate in safety training sessions that focus on first aid, adult CPR, and bloodborne pathogens. Throughout the year, CRA provides our employees the opportunity to attend additional training sessions. Recent topics included trenching and excavations, roadway safety, driving, working around heavy equipment, workplace ergonomics, and extreme weather safety. In addition, CRA conducts regular safety training for its project personnel tailored to the specific needs of the particular project. This is accomplished, in part, by daily safety briefings, or for larger, long-term projects, weekly safety meetings geared towards the specific conditions of that project. CRA’s corporate office has a designated safety officer, whose function is to develop and advocate measures for assuring workplace safety. Our safety officer periodically performs in-the-field health and safety audits to ensure that workplace safety remains a primary concern and that our policies are diligently followed. All CRA employees are required to review our safety policies annually. Our employees are encouraged to recognize and report unsafe working conditions and behaviors. If project conditions are reported as “unsafe,” our employees are empowered to halt operations until a remedy can be properly implemented. Through our company-wide dedication to employee safety, CRA prides itself on fostering a safe work environment while meeting our obligations to our clients. CRA is in good standing with ISN and Avetta safety compliance programs.